Our published materials include fiction and non fiction numbering more than 2300 titles. The Archives is committed to gathering and preserving materials by and about lesbians and feminists of all classes, ethnicities, races and experiences. Included are personal letters and scrapbooks, artwork, manuscripts, books, records, newspapers, magazines, photographs, videotapes, flyers, papers of lesbian organizations, private papers, and even clothing, such as softball uniforms from the 1940s and 50s. Hundreds of lesbians and feminists have been inspired to donate artifacts of their personal and collective histories. The Archives encourages all lesbians to deposit the everyday mementos of your lives so that others can discover them in the future. The privacy of any donor is protected to whatever extent desired. Contact the Mazer to learn more about its special collections. If you are interested in donating your own special collection, please contact us directly. Please note, that before donating any items to the Mazer, we ask that you first contact us by snail mail, email or phone to ensure the safety of your items. In 2014, we completed work with the UCLA Center for the Study of Women and the UCLA Library on the NEH Grant which resulted in over 80 collections processed by UCLA. 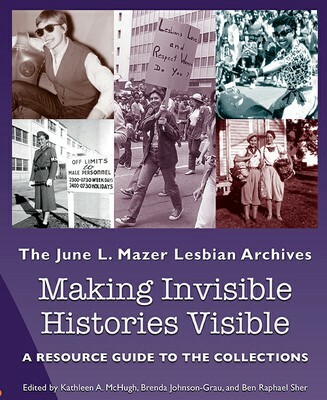 From that project, emerged this guide entitled,“Making Invisible Histories Visible”which describes the scope of the work, the people involved and the lesbian and feminist women’s collections that were processed. “Making Invisible Histories Visible: Preserving the Legacy of Lesbian Feminist Activism and Writing in Los Angeles” project was a three year project to arrange, describe, digitize, and make physically and electronically accessible two major clusters of Mazer collections related to West Coast lesbian/feminist activism and writing since the 1930s. Edited by Kathleen A. McHugh, Brenda Johnson-Grau,and Ben Raphael Sher, the guide is now available in PDF format. Please use the link below to read online or to download & read in any PDF reader. For detailed information on the partnership project initiated by the UCLA Center for the Study of Women to inventory, organize, preserve, and digitize several of Mazer’s key Los Angeles-themed collections and the resulting online finding aids, click here.